The first room is a walk-in biography of Valentino Garavani (famously known by only his first name just like Cher) with timelines highlighting key points in his career and displays of candid photographs, sketches, show invitations, press cuttings and correspondence from the likes of royalty, film stars, fashion editors and fellow designers. It resembles shoeboxes and scrapbooks of memoirs tipped out and meticulously categorised. I did become a little weary of the constant celebrity name-dropping - is it too vulgar? - but it does emphasise the incredible influence Valentino had in the world of high fashion. 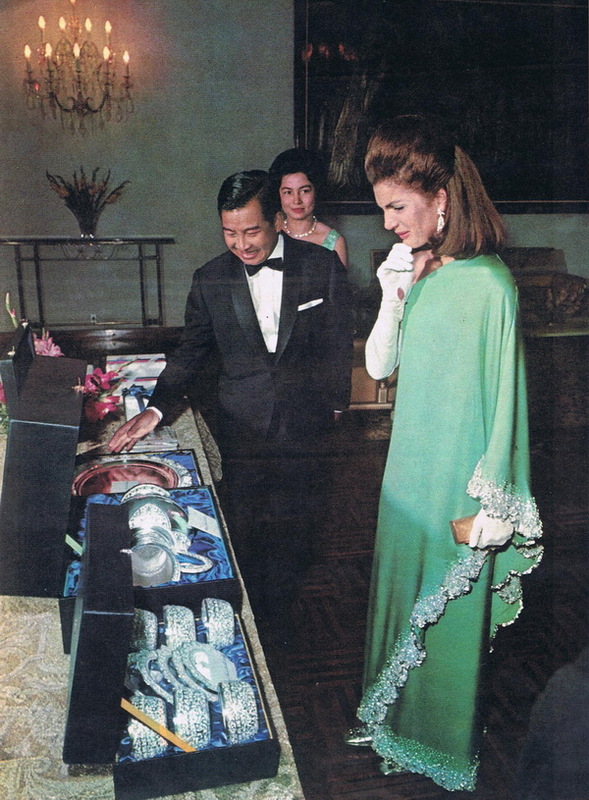 Jackie Kennedy in a one shoulder Valentino gown during her visit to Cambodia in 1967. The main room, “The Catwalk”, displays over one hundred and thirty (yes, that’s right, over one hundred and thirty!) couture gowns from the 1950s up until recent designs by Pier Paolo Piccioli and Maria Grazia Chiuri who took over from Valentino after his retirement in 2008. The mannequins are painted in key colours such as mint and mustard to indicate which decade their gown belonged to. I ignored this and played a game of Guess The Decade (the 60s and 70s were easy, the 2000s not so easy). Looking at couture garments up close you realise the intensive work that goes into production. Each item on display has intricate details such as elaborate sewing techniques, layers of luxurious fabrics such as chiffon and lace, hand painted patterns including Delft and multi-faceted embellishments. In the Catwalk room there is no clear star number as all the gowns are equally spectacular with lush colours and rich textures you want to dive into. Favourites of mine include the long green silk embellished dress with printed panthers from A/W 1967/68 and the White Collection of S/S 1968 characterised by soft dreamy fabrics of organza and tulle and finished off with delicate details such as lace applique and small flowers. The final part of the exhibition shows the labour behind couture with a display of the wedding dress worn by Marie-Chantal Miller which took twenty five seamstresses to put together and includes twelve types of lace. There is also a video showing interviews with Valentino and his partner Giancarlo Giametti. The video also includes a tour of the Valentino Garavani Virtual Museum which is a downloadable desktop application showcasing Valentino’s work which was launched in 2011 to great acclaim. At the very end, material samples and video clips of various couture sewing methods are displayed such as the Pagine technique which creates a flamboyant moving page effect. I left the exhibition all starry eyed and with a better understanding of couture - the racing car of fashion. 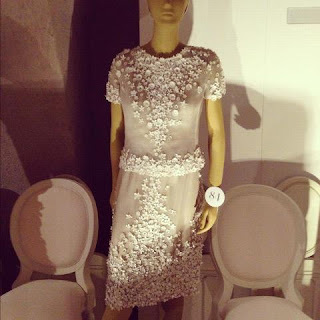 Valentino: Master of Couture gives an insight into a world of beauty, elegance, exclusivity and precision. A must-see show for lovers of fashion and design along with those who just enjoy celebrating the aesthetic - now that’s La Dolce Vita!